Unmanned Aircraft Systems Operators in the U.S. Army are remote pilots of unmanned observation aircrafts that gather intelligence used in operational tactics. As intelligence specialists, they are integral to providing Army personnel with information about enemy forces and battle areas. 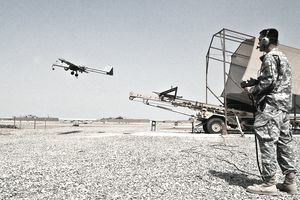 The UAS operator supervises or operates the unmanned aerial vehicle (UAV), such as the Army's Shadow Unmanned Aerial Vehicle, and supporting systems to gather intelligence for mission planning, mission sensor/payload operations, launching, remotely piloting and recovering the aerial vehicle. Prepares and conducts air reconnaissance missions. Operates mission sensor/payload for target detection. Plans and analyzes flight missions. Deploys and redeploys the TUAV ground and air system. Operates and performs operator level maintenance on communications equipment, power sources, light and heavy wheel vehicle and some crane operations. Launches and recovers the air vehicle. Performs pre-flight, in flight, and post-flight checks and procedures. Directs emplacement of ground control station. Directs emplacement of launch and recovery systems. Supervises and assists in air frame repair. Coordinates evacuation and replacement of parts and end items. Job training for an unmanned aerial vehicle operator requires 10 weeks of Basic Combat Training and over 23 weeks of Advanced Individual Training with on-the-job instruction. Part of this time is spent in the classroom and in the field. Performing intelligence, surveillance and reconnaissance simulation missions. Preparing maps, charts, and intelligence reports. Never been a member of the U.S. Peace Corps, except as specified in Army Regulation 614-200, chapter 1. No record of conviction by court-martial. No record of conviction by a civil court for any offense other than minor traffic violations. Related to the unmanned aircraft systems operator job is the unmanned aircraft repairer (MOS 15E), which is primarily responsible for the maintenance functions on Unmanned Aerial Vehicles. They keep the aircrafts ready to fly and ensure their ability to collect and transmit information. The skills you learn will help prepare you for a career with federal government agencies such as the Central Intelligence Agency or the National Security Agency. It can also prepare you for other fields such as research or business planning. After serving in the Army as an internment/resettlement specialist, you may be eligible for civilian employment by enrolling in the Army PaYS program. The PaYS program is a recruitment option that guarantees a job interview with military friendly employers that are looking for experience and trained Veterans to join their organization.